We’ve been dreaming of ways to make it more financially sustainable for people to be yoga teachers and for students to have a practice that truly supports them. We understand yoga teachers can’t rely on studio classes alone to bolster financial stability. And we know how hard it can be to find a teacher at a studio who gets you. We want to improve this situation. We are building a booking service on Setu to connect teachers and students for 1:1 and small group sessions. Our goal is to create space for teachers to grow their business and students to feel comfortable in their bodies. We are calling this service Setu for You. Setu for You will be built into our existing yoga teacher directory. The booking experience will be similar to browsing the directory today but with added navigation and information to guide people in finding the right teacher to work with. Sessions will be offered in packages of three or more. Teachers will personalize their own session packages and rates, based on experience, with a minimum of $80 for a 1:1 session and $120 minimum for the small group sessions of three people or more. Setu will add 7.5% to each booking total, as a fee. In addition, both teachers and students will have personalized profiles on Setu, so they can get to know each other before connecting through our messaging tool. 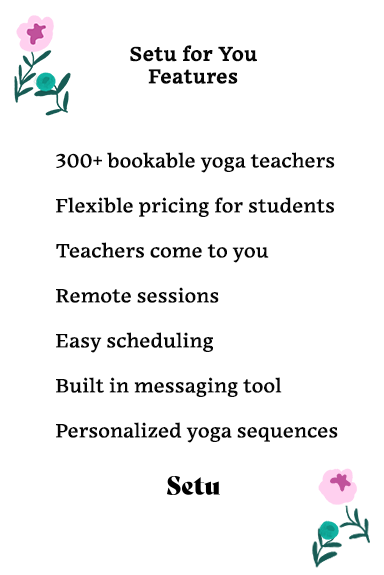 The messaging tool will create space to plan sessions, provide recaps and share a copy of each personalized yoga sequence. The Setu community has grown and thrived because of you! We want to stay by your side and keep supporting you where we can. To build Setu for You, we need to raise $200,000. The money will go towards hiring a skilled team, contracting accounting and legal services, creating a marketing launch plan and buying the best web tools to integrate into our website. This will not only build Setu for You, but also sustain our community and increase its impact. With these resources we plan to launch Setu for You by August 2019. ﻿Visit our Indiegogo campaign to learn all the details and spread the word!